Viking Vets - Puppy parties - Your local vet based at Chevening, Station Road, Henbury, Bristol BS10 7QQ. We offer all puppies that are registered with us free puppy parties. The puppy parties are run on a Monday afternoon by one of our nurses. 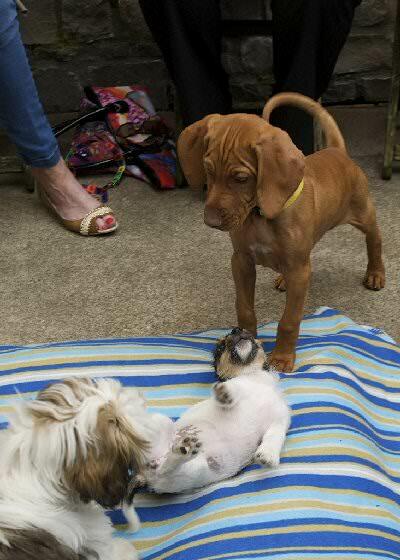 Puppy parties provide a great opportunity for puppies of a similar age to meet and play. They are also an invaluable experience for your puppy to learn how to correctly interact with other puppies. It is surprising how many puppies start the party being shy and hiding behind the owners legs but soon they are rough and tumbling with the rest. The puppy parties are for puppies that have not yet gone outside (in a public place) and have had their first vaccination.